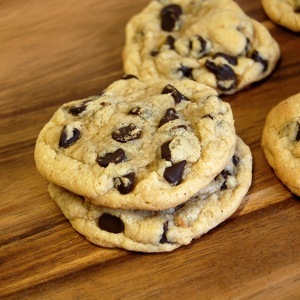 I got this Chocolate Chip Cookie recipe from a blog called A Pookie Pantry. It appears to be this AllRecipes version, but with the addition of cream of tartar to the cookies. I bought the cream of tartar for like three bucks then realized that I only needed about 1/4 teaspoon AND the original recipe did not call for any at all. Bummer. Here is the result of two minutes of Googling: cream of tartar is most often used, it seems, to help stabilize and give more volume to beaten egg whites. Wikipedia has more uses. 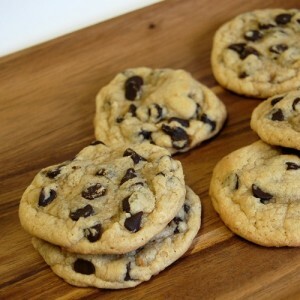 In baking and making cookies, however, cream of tartar (the acid) is added to baking soda (the leavening agent) so that when combined with the wet ingredients, it causes the reaction that gives cookies their rise. Think back to the volcanoes you made in school: you added vinegar (the acid) to baking soda and water, and that caused the awesomeness you subsequently witnessed. Now, baking powder, on the other hand, contains the acid, the leavener, and other stuff. The more you know. Back to the cookies. I didn’t add walnuts because, well, I didn’t want to. So I added more chocolate chips to compensate. This little bit of baking genius I thought up all on my own. One thing I’ve also started doing with chocolate chip cookies so to cover up the bottom of the cookies so no chocolate chips are visible. That way they don’t melt to the baking pan. 1. Cream butter and sugars. Beat in egg, then vanilla extract. 2. Dissolve baking soda in hot water (I used a measuring cup to hold the water). Add to batter along with salt and mix. Mix flour and cream of tartar, then add them to the batter and mix it all up. Stir in the chocolate chips. 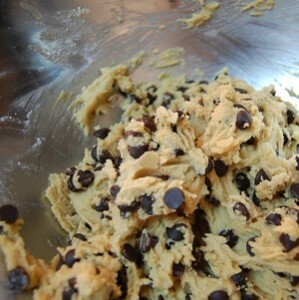 Refrigerate for an hour, even longer if possible. 3. 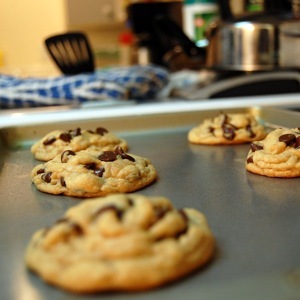 Preheat oven to 350 degrees F. Add cookies to baking sheets in average sized portions (use an ice cream scoop, maybe?). Bake for about 8 to 10 minutes, or until edges are lightly browned. Remove from oven and cool completely on wire racks. I made 19 chocolate chip cookies; not huge ones, but they’re bigger than, say, Chips Ahoy. 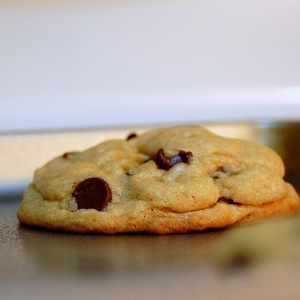 I like my chocolate chip cookies soft, so I leaned quite close to eight minutes.